If there’s anything new to learn from Characters, a series of personality portraits written by the ancient Greek Theophrastus (c. 371 – c. 287 BC), it is that gluttons, chatterboxes, drunks, idiots, and others are not unique to any time or place in human history. A new translation offers a fresh look. If there’s anything new to learn from Characters, a series of personality portraits written by the ancient Greek Theophrastus (c. 371 – c. 287 BC), it is that gluttons, chatterboxes, drunks, idiots, and others are not unique to any time or place in human history. This robust little volume of character sketches has been widely published and translated since its first appearance twenty-three centuries ago–Jean de la Bruyère’s Les Caractères (1688), Character Writings of the Seventeenth Century (1891) and the Loeb Classical Library’s edition are a few that come to mind–but each translation is an interpretative undertaking, meaning there is always a renewed need for fresh viewpoints. On October 1, Characters will be once again published in English, this time by Callaway Arts & Entertainment. 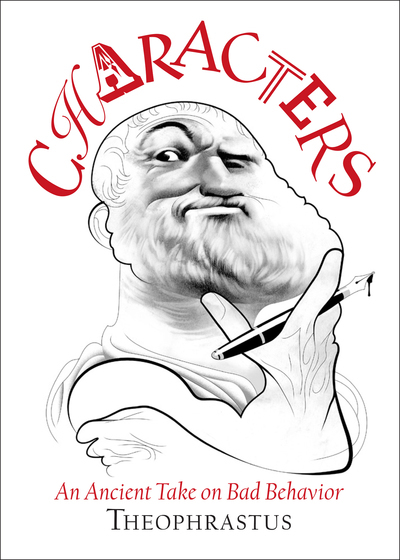 Translated by Pamela Mensch with vibrant pen-and-ink illustrations by acclaimed caricature artist André Carrillo, this edition includes insightful annotations by Bard College classics professor and Guggenheim recipient James Romm. “These are flesh-and-blood people, with very familiar flaws and foibles,” Romm explained. “They remind us that ancient Greeks were actual human beings, not marble busts. The past no longer feels like a foreign country. It’s a true gift to be able to ‘feel’ the reality of the classical world.” As Romm points out in his introduction, some previous translators could not square with the lack of judgement in Theophrastus’s sketches and inserted their own. This edition strips away those addendums, allowing the original descriptions to be read on their own merit. Theophrastus’ Characters: An Ancient Take on Bad Behavior, by James Romm, André Carrilho, and Pamela Mensch. Callaway Arts and Entertainment; $24.95, 119 pages. This story first appeared on the Fine Books Blog on September 28, 2018.